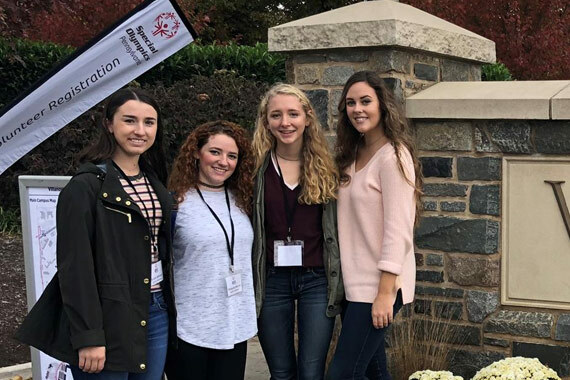 Philadelphia, PA – Four Geneva College students were invited by the Special Olympics of Pennsylvania to visit the University of Villanova's Fall Festival event, the largest student lead Special Olympics event in the state on November 3 and 4. The students learned how to manage a similar event in the Beaver County Special Olympics Track and Field Championships, which is hosted at Geneva's Merriman Athletic Complex and has recently become a student-led event. Maddie Ehko (Junior/Communications Disorders), Sarah Johnson (Freshman/Biology), Miranda Mazza (Junior/Chemical Engineering) and Corinne Alderfer (Junior/ Accounting-Business Major) made the trip. Ehko said, "This was a great experience we were blessed to have! I am very hopeful that we are able to transform the ideas that we brought back from Villanova to our event." Alderfer echoed those comments, "We are so grateful to have the opportunity to work with the Special Olympics at Geneva. It provides great satisfaction watching these athletes compete." Geneva College is a Christ-centered academic community that provides a comprehensive education to equip students for faithful and fruitful service to God and neighbor. Offering over 115 traditional undergraduate majors and programs, an array of fully online Adult Degree Programs, and high-demand graduate degrees, Geneva's programs are recognized for their high quality. U.S. News & World Report ranks Geneva as a Top Three Best Value Regional University with one of the top undergraduate engineering programs in the nation. Adhering to the truth of Scripture, a Geneva education is grounded in God's Word as well as in a core curriculum designed to prepare students vocationally to think, write and communicate well in today's world.